Chronic Fatigue - Cameron Dixon apologies for the lateness of this issue, and suggests that this is the most fan-friendly season of the revived series to date. WhoLine - The latest news from the worlds of Doctor Who, Torchwood, and The Sarah Jane Adventures. Fluid Links - Robert Smith? the opening episodes examines in a surprising manner of the series. Spring 2011 Review - Greg McElhatton isn’t terribly besotted with The Curse of the Black Spot. Block Transfers - Julie Chaston praises our discovery of The Doctor’s Wife. Love and Monsters - Friends, Romans, countrymen; Deborah Stanish comes to praise Rory Williams, not to bury him. Crater of Needles - Gian-Luca sees no need to vent his spleen about The Rebel Flesh. LionHearted - David J. Lamb bemoans the loss of one of the classic series’ characteristics: the Doctor’s asexuality. The Tempered Schism - Peter McAlpine follows a good man to war, and finds that it’s not as problematical as it appears. The Land of Fiction - Graeme Burk reviews The Complete Fifth Series on DVD—as well as The Ark, Planet of the Spiders and Terror of the Autons, The Awakening and Frontios, and The Sunmakers and Paradise Towers. 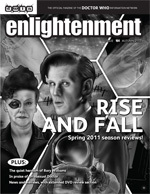 Plus, reviews of the April 2011 Eleventh Doctor novels, the Lost Stories Animal and Earth Aid, the BBC graphic novel The Only Good Dalek, and Time, Unincorporated: Volume 3.